A friend came over to paint the new kitchen island that we built because when it comes to painting Lee and I pretty much stink. Seriously, a band of monkeys on a sugar high could probably paint a wall better than Lee and I. So, while our four kids wreaked havoc on house, I walked behind them and reorganized closets and cabinets. Pulled out more toys for next week’s garage sale and fielded calls from people wanting to buy the items I posted on Craig’s List at 5:45 this morning. (I just sold an old desk that’s been sitting in our basement for five years – I love Craig’s List!) All in all, it was a good day. I know all about being tired, I am so dragging today!! Craig’s list is awesome, Cory uses it all the time to sell stuff he actually got Carol using it for awhile too I think you could find someone to pretty much anything! 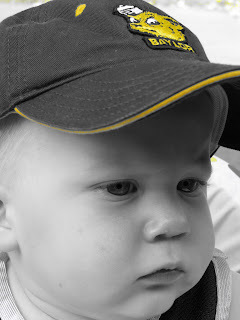 Great pics of Landon he is getting so big! Claire wanted to play with Tia so badly both yesterday and today, maybe we can get together tomorrow?? See how tired I am not even making sense in my comment. I meant to say I think you could find someone to buy pretty much anything, sheesh! Still not making sense, man I give up! 🙁 Man, you sure did get some stuff accomplished today girl!! I did 1 load of laundry and didnt fold it til 7hrs later. 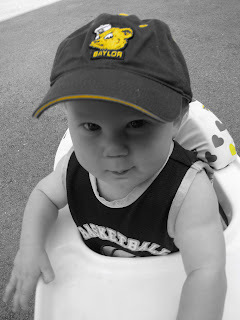 Landon is looking so sweet…..I think he’d look even cuter with a tiger on his cap….Go MIZZOU! those days when everything clicks are the best! Go Bears! I love getting up at 5 am. It’s the slump at 2 pm that KILLS me!!! See you mañana.